In production since 1992, Japanese manufacturer Subaru are now on the 4th generation of their sports hatchback the Impreza. Popular with those looking for an exciting driving experience, the Impreza has a reputation for speed due to the fast turbocharged WRX and WRX STi versions available and the Subaru Impreza World Rally Car. Special features of the Subaru Impreza include their naturally aspirated ‘boxer’ flat four engines which give the car a low centre of gravity which can reduce body roll and enhance handling. It is also available in an all wheel drive option for extra traction when needed. You may be surprised to find the Subaru Impreza is also a reasonably practical car too with good visibility, decent boot space and enough leg room in the back seats for adults. Not just a fun drive but suitable for everyday family life too. Imperial Cars currently have several impressive Subaru Imprezas in stock including a stunning white 2014 4 door WRX STi 2.5 with 4 wheel drive, an impressive 300BHP and 0-60 in 5.2 seconds. If this is a little above your budget how about this fun and sporty looking 2007 Impreza 2.5 WRX STi which also benefits from 4 wheel drive and sporty bodywork which will certainly get you noticed! 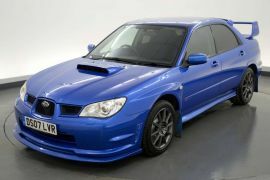 Why not come and browse Subaru Imprezas in stock at Imperial Cars?